If you do Bi-weekly payrolls, you pay employees 26 times a year. If you have monthly deductions, like health insurance, you have a monthly amount for each employee to deduct. Problem? 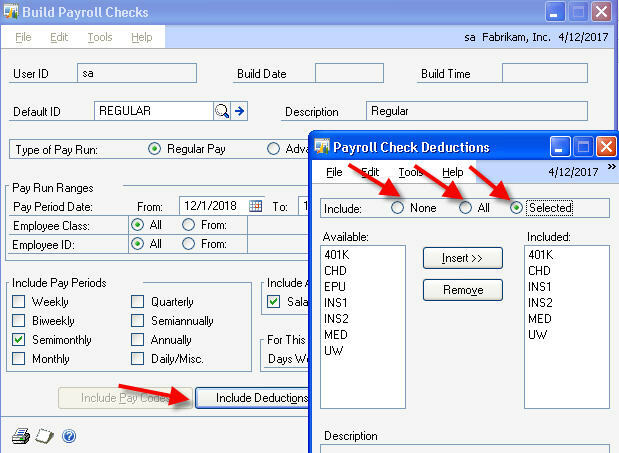 If you annualized the monthly deductions and divide by 26 and use that amount each pay period, than you'll have great difficulty balancing your payroll accounts in the General Ledger. Also, if an employee leaves your company, it's likely you'll have to settle up for the difference in the deductions, which usually means the employee will owe you money. How to fix it? Divide the monthly deduction amount by half and take out of each pay period for the first 2 pay periods of the month. If a month has 3 pay periods, use a different "Build Payroll Check" ID and on the Deduction and Benefit button, use the Selected radio button and do not select those monthly deductions. This means a couple of pay periods during the year the employee will get more money which will make them happy. Also, you'll be able to balance your General Ledger payroll accounts more easily! Its a win win!